The Bible didn’t fall from heaven in any language, let alone old English. It was communicated from God through people in the common language of the day – Hebrew for the Old Testament, Greek for the New. People have given their lives to the work of Bible translation, whether into understandable English or any other language. The Bible says, “Your word is a lamp to my feet and a light for my path” (Psalm 119.105, NIV). We begin the message by reading that verse and a few before it, and then we learn about what the Reformation has done for the church in terms of making the Bible available in common language. Listen to the message by clicking here. Four hundred years ago, history was made. In the early years of the seventeenth century, the English language, and the Christian faith, were changed forever, when the reigning British monarch (at the suggestion of some Puritans) declared that the Bible would be translated into the English of the day in what would be called an ‘Authorized Version’. We know it better by the name it was given in honour of the monarch: the King James Version. It was first produced in 1611. Nothing has influenced English literature, or English Christianity, to the same extent as has the KJV. Yet initially, it was not widely accepted! There had been several English Bible translations made in the years following the Protestant Reformation, and a few of those remained popular into the 1600s, most notably the Geneva Bible. So when this “new innovation” came along in 1611, people were not quick to adopt it. 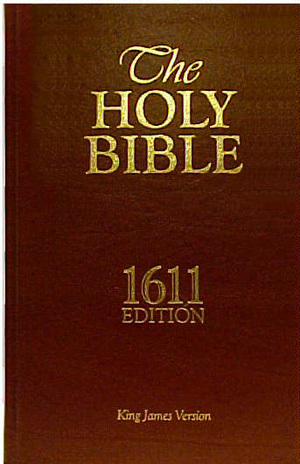 Once it took, however, it took for good: after a couple of revised editions (you’d hardly be able to read the original 1611 edition, because the language has changed so much), no other Bible translation in English was employed as much as the KJV until the introduction of the Revised Standard Version in the 1950s, and the New International Version in the 1970s. Since the middle of the twentieth century, there have been many English translations made, all with the intent of being as close to the original languages as possible, while being eminently readable by a contemporary audience. Many folks miss the fact that the same intent was true of the king’s 17th century translation as is true of modern translations: faithfulness to the original languages, and readability by a contemporary audience. See, folks in the 1600s actually talked the way the KJV reads. Thees, Thous, Whithersoevers and Forsooths were part of the everyday language of the people. It was a “modern translation” in 1611 when it was produced, just as Good News For Modern Man was modern when it was produced in 1966, and The Message was modern when it was produced in the 1990s. Language is always changing, so Bible versions change along with the language. What I love about this is that God speaks your language, no matter what that language is. God speaks Hindi and Urdu, Cantonese and Mandarin, Twi and Fante, Arabic and Farsi. And many, many more. That’s why God’s Word needs to be in these languages. And that’s why Bible translation continues to be an important parachurch ministry. God, whose love is universal, speaks the heart language of all the people of the world. So when we celebrate the 400th anniversary of the King James Version – a landmark Bible translation in English – let’s pray for the work of Bible translators everywhere, that it will prosper so that those who speak the 3000-plus languages which still lack even one word of Scripture translated will be able to read about how much God loves them in their own tongue. We take for granted having the Bible in our language, but for many in the world, it’s still something for which they wait. “Your word is a lamp to my feet and a light for my path” (Psalm 119.105, NIV). Read the Bible today, in your heart language, and thank God for the gift of his Word. Every competition of every sort typically has an underdog, and people like to see the underdog do well. The Bible has its share of underdogs. One of the earliest-recorded tales of an underdog comes in 1 Samuel 17. In that story, we learn about young David, who would one day be king of Israel, who agrees to fight a massive Philistine named Goliath. David was a little guy, and Goliath was a big guy. Goliath was the bully, and David would be his next victim – or so one would think. But as you read the story, you quickly learn that David has something in his favour. It certainly wasn’t armour, for David quickly discovered that armour only hindered him. Instead of armour, he would arm himself with five smooth stones. Being a young shepherd, he was pretty good with a slingshot, for that is what he used to keep his sheep safe from enemy attacks. But that’s not really what David had going for him. No, David had something else – Someone – that his giant enemy lacked: the blessing of God. 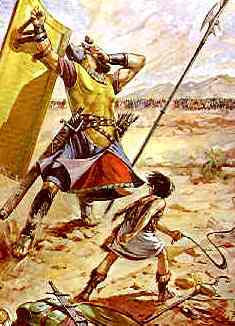 The entire Israelite army couldn’t tackle Goliath, but little David could do it with one well-placed stone between the eyes. This seems an unlikely tale; you couldn’t be blamed for thinking so. Nowadays, battles aren’t fought that way. But then, most who go into battle today don’t have what David had – indeed, it doesn’t even occur to them. The blessing of God doesn’t apply only to battles between nations; in fact, it doesn’t apply all that often to battles! But it does make a difference in our day-to-day matters (some of which are, admittedly, battles of another sort). When you set out to do something, do you seek the blessing of God in so doing? Put another way, are you thinking, when you go to do something, I wonder what God thinks of this? Seeking God’s blessing for what you do does not involve either the extreme of being paralyzed for fear of doing something out of God’s will, or the extreme of doing anything you want to do and asking God to bless it. No, to seek the blessing of God involves, first, being saturated in his Word so that you have a growing picture of what God’s will is, since the Bible is the first place that God in Christ, by the Holy Spirit, reveals his will to humanity. It also means living in relationship with God so that your primary motive is to please (not appease, but please) God. Let your guide be the words of the Psalmist: “Look to the Lord and his strength; seek his face always” (Psalm 105.4, NIV). That’s how David slew Goliath, and it’s how you and I can live each moment of every day. To wrap up our series on parenting, I thought it would be good to spend some time thinking about how best to deal with kids who end up lost. If we haven’t had one ourselves, we know someone who has, or we may even know a lost son or daughter. What can we do? 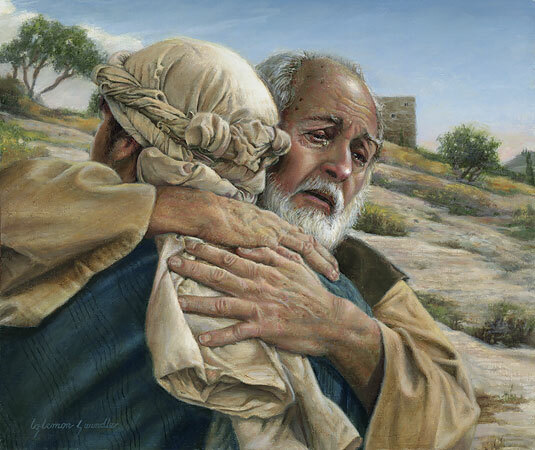 In this message, based on the parable of the lost son (in Luke 15.11-32), we learn God’s approach to dealing with lost children. Whatever you do, don’t give up. Listen to the message by clicking here. Feel free to comment and share your story of lost and/or found children, and how you dealt with it (or are dealing with it). Know you’re prayed for! You know, a rhythm: no matter what our favourite kind of music may be, we can all, periodically, find our toes tapping to the beat, the rhythm, of the music – even if the music is just going through our minds instead of being heard through our ears. But everybody has another kind of beat, another kind of rhythm: a rhythm of life. personal regularity, we find ourselves flitting from this appointment to that, and life lacks a regular rhythm. You’re thinking, I wish it wasn’t that way. And the good news is that it doesn’t have to be that way. Most of us wish for a slower pace of life, where we’re not keeping up with the Joneses and we’re able to do some of the things we know are good for us. We think it’s impossible, but it isn’t. We just have to want it badly enough that we make it happen. And if we’re followers of Jesus, we can make that natural, God-given rhythm of life happen for us. By opening ourselves to God’s plan for our lives, we can find that rhythm begin to take shape in our lives. Let me give you a personal example. I’ve never been what you’d call a ‘morning person’. I think from a very early age, I became accustomed to getting some of my best work done at night. My undergraduate years solidified that for me, since most of my classes were in the evening. I would get up at about 10:30, eat lunch, go to classes, come home, do my homework, and fall into bed at around 2 or 3 in the morning. While I can’t sustain the 2:00 a.m. routine anymore, I still can’t identify myself as a morning person. until a few weeks ago. I had been longing for more time with the Lord, and one morning, at the ghastly hour of about 5:45, I found myself awake, without the elp of an alarm. Figuring God had set an appointment with me, I rose, went to a space I had set aside for my time with God, and read Scripture, prayed, and just enjoyed God’s presence as the sun rose. That was a precious time. time to allow me to carve out that time with God, intentionally to create a rhythm in my day that began with the Lord. What happened next absolutely amazed me. days, I lay in bed and negotiate with God for a few extra minutes, and occasionally, he gives them to me. But I still rise ahead of the alarm, and engage in richer fellowship with God than I can remember having had in a very long time. While I’m not sure I’d call myself a ‘morning person’ just yet, I do find that my evenings are ending sooner, and my time with God is happening every morning. The adventure is new each day. There is little predictability to it, except that I will awaken early, and I will read Scripture and pray and do some other things with the Lord. I’m crazy excited about what God is doing in my life. And I tell you this simply to say that if it can happen in my life, it can happen in yours. There is a great deal that still happens all day and into many evenings, but it all happens with a different perspective, simply because of how the day has begun. Many of us say that we can’t afford the time – that we need the sleep we do get. I came to the conclusion that God will give me as much sleep as he knows I need, not how much I think I need. And I’m trusting God, day by day, to give me exactly what he knows I need. feels right, where the beat is exactly what resonates with you. Why not try it? Maybe yours won’t be first thing in the morning; it might be in the middle of the day, or before bedtime. Commit to God your willingness to let him carve out the time with him that you need to enrich your Christian life. God wants nothing more than to enjoy time with us, and for us to enjoy time with him. Commit to a rhythm of life that has a steady beat, and watch what happens to your walk with the Lord. “God gives rest to his loved ones” (Psalm 127.2c, NLT). I’d love to hear from you if you give this a try, or if you have done this already. It would be great to hear your story of rhythm and fellowship and rest! Are you disciplined enough to discipline your kids? One of the reasons we see so much crime among young people today is because they have not received sufficient discipline from their parents. And by “discipline” I don’t mean beating with a stick; I mean things like setting consistent boundaries, letting them experience consequences, and having a unified front among parents: correction driven by love. It’s not easy to discipline kids. We want them to love us. But the best way we can show our unconditional love for kids is by giving them godly discipline. The message you can listen to here is based on Hebrews 12.5-11, and includes several quotations from the book of Proverbs. Parents, you have a hard job! Count on my prayers as you do your best to love them in the Lord. Alas, poor Steve Jobs, we hardly knew you! When someone famous dies nowadays, the various media find ways to pay tribute to that person. 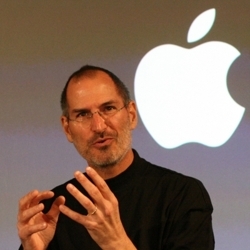 This week, when Steve Jobs died, many of those tributes, appropriately, took place via the Internet. This makes sense, since the company Jobs co-founded, Apple, revolutionized the world of computing – not just once, but time and time again. I’m a relatively recent convert to Apple, acquiring an iPad and an iPhone this year. (I still use a PC for my general computing needs, however, so I’m a bit of a hybrid in that way.) In using these tools, however, I have come to appreciate the degree of innovation that is required to make online technology as simple as it is today. No one doubts that Steve Jobs was an innovator. I’m not sure what Steve Jobs’ spiritual position was. Some say he was a self-styled Buddhist who had been baptized a Missouri Synod Lutheran as a child. So what he meant by what he said might differ from the way I interpret it. Regardless of that, however, his words can be instructive for us as followers of Jesus. We who know the Lord have confidence that when we die, we will enter the glorious, eternal presence of the living God himself. Still, if we’re honest, most of us really aren’t all that interested in dying. Or, to put it more accurately for some, dying doesn’t bother us, but the process of reaching that point is not something we look forward to. We want to see the Lord, but we don’t want to leave our loved ones; we want to be in heaven, but we don’t want to have to die to get there, as Jobs said. God has given you a life to live, and as a follower of Jesus, you can take comfort in the words of the Saviour himself: “I have come that they may have life, and have it to the full” (John 10.10, NIV). None of us knows how long we have, so let’s live the life Jesus has given us, and live it fully, to his honour and glory! I hope yours is long and fruitful!